Boy, it’s been a while since I wrote in my blog. Today, being the holy of holies for those of us who are Irish or just Irish wannabes, seems like a fitting time to add to my self-indulgent yammerings. It’s St. Paddy’s Day, and as I sit at my computer, I have a constant reminder of my first trip to Ireland. In 1999, the DH and I took the boy on a CIE motor coach tour of the auld sod. 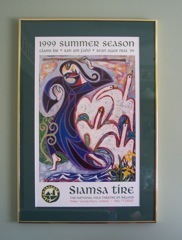 One of the stops was Siamsa Tíre (pronounced SHIM-sah TEER), the National Folk Theatre of Ireland in Tralee, County Kerry. The show was a lovely ballet rendition of the story of Clann Lir–the children of Lir–who were turned into swans by their evil stepmother. Posters were on sale at the event, and DH bought one and we had it framed. It now hangs on the wall behind my computer monitor and is a daily reminder of that wonderful trip. 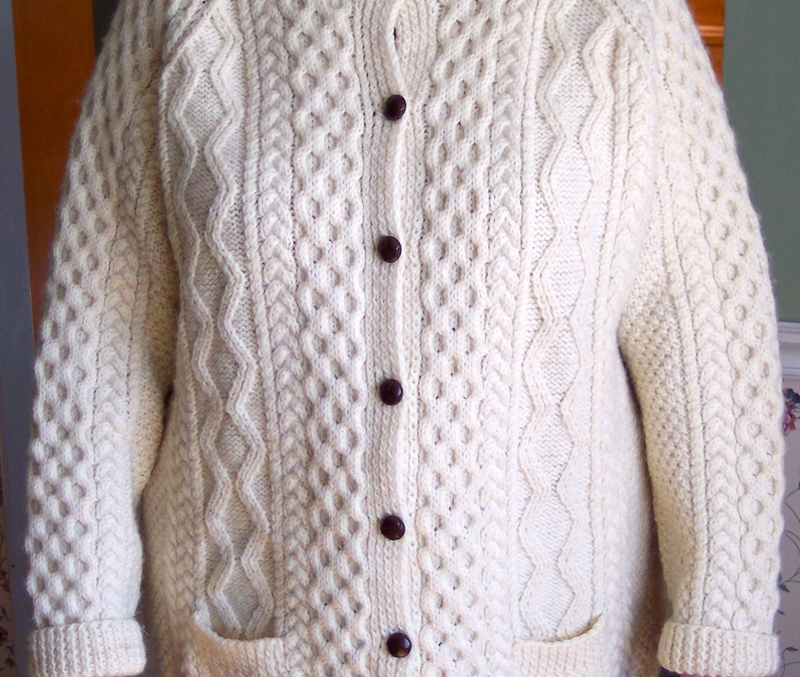 The lovely Aran sweater pictured above was also purchased on the first trip to Ireland. It was hand-knitted by Mrs. Foley, according to the tag, and I purchased it at the Blarney Woollen Mills in Blarney, County Cork, for 90 punts plus tax. The punt was the old Irish pound and I paid around $130 USD. You wouldn’t believe the stacks and stacks of hand-knitted sweaters they had at the Blarney Woollen Mills. I hope the ladies who knit them get their fair share of the price. My sweater is very well-knitted and very warm. I use it as a jacket because it is simply to warm to wear in the house. Lately I have been knitting like a demon. I am so in love with Liz Lovick’s Orkney Pi and the J & S Shetland Supreme yarn that I can hardly tear myself away from it. I have been making steady progress, having completed the first repeat of section 3, which is made up of a diamond pattern. Right now the shawl looks like a tangle mess, but once the shawl is completed and dressed, the magic of stretching wet wool will have transformed it into a thing of immense beauty. I have effected the transformation many times, but it never ceases to amaze me. 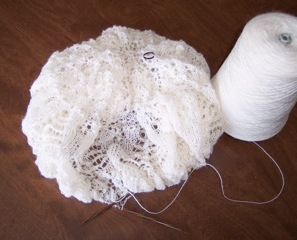 Yes, folks, this jumble of yarn will turn into a butterfly.